Terra's words sum her up best: "You claim to be radiant, but all I see are shadows of jealousy, hanging thick on your heart." The Evil Queen is absorbed in her beauty and would stop at nothing to be the fairest one of all, even if it means killing and extracting the heart of her perceived rival, Snow White. 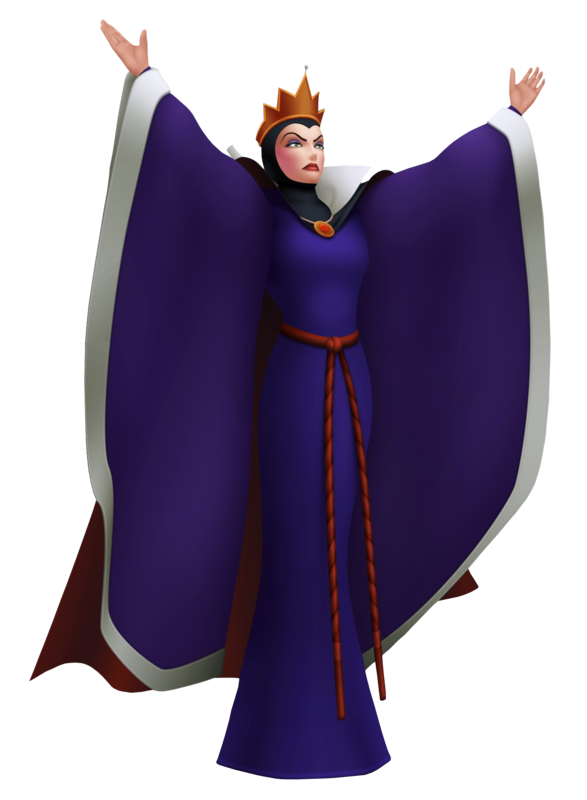 She seeks a compromise with Terra: If he eliminates Snow White, he will be able to use her Magic Mirror to determine Master Xehanort's whereabouts. Terra is able to glean the necessary information from the Mirror anyway without resorting to dark deeds, and the Queen, wary of the power the Keyblade Wielder holds, decides to handle Snow White's murder herself. Armed with her black magic, the Queen disguises herself as a peddler woman and successfully tricks Snow White into eating a poisoned apple. Though her ultimate fate is unknown, it is clear that her victory was only short-lived. When Aqua arrives to the Queen's castle, she finds it abandoned, and the Mirror no longer performing its duties as soothsayer once it has ascertained that his mistress is dead.